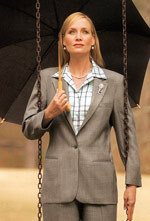 Mens Suit Separates also stocks the best in womens separates and womens slacks. Find a wide assortment of womens slacks, coats and skirts in matching colors and fabrics. Our year round womens separates will be just right for you. But don’t just take our word for it—browse our online womens separates selection and see for yourself. Buying womens separates means you can customize the size combination of a coat & womens slacks / skirt, creating a better fit than you’ve ever experienced. 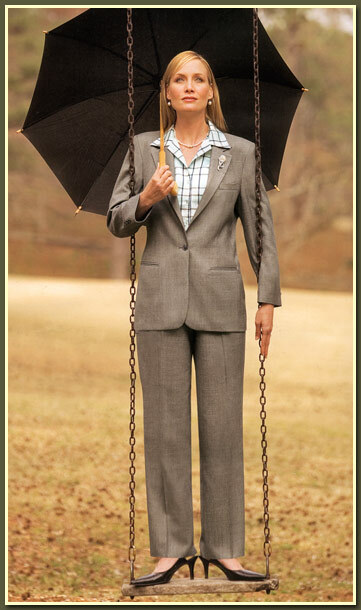 And our womens separates lets you also order an extra slacks/skirt and extend the life of your entire suit. All womens separates ordered online from Mens Suit Separates are shipped within 48 hours to you direct from the factory. Visa, Mastercard, American Express, Discover and PayPal are accepted. Complete return for refund or exchange for all products if unworn and unaltered within 30 days minus shipping charges. Return authorization needed. Black / White Shark Skin 55% Dacron Polyester 45% Worsted Wool "Harness Weave"